The circuit shown here works from 24V DC and can flash two 24V bulbs alternatively. The circuit is nothing but an astable multivibrator operating at 1Hz and 50% duty cycle. The lamp to be flashed is connected in place of the collector resistor (Rc) of a typical design. 2N3055 transistors which are well known for their ruggedness are used here. They can handle collector currents up to 10A. So a wide range of lamps (in terms of wattage) can be connected to this circuit. Use 24V DC for powering this circuit. Lamp L1 and L2 can be 24V/25W type. It is advised to fit the transistors with heat sinks. Flashing rate can be modified by adjusting the values of R1, R2, C1 and C2. what will be the voltage across the lamp while flash? 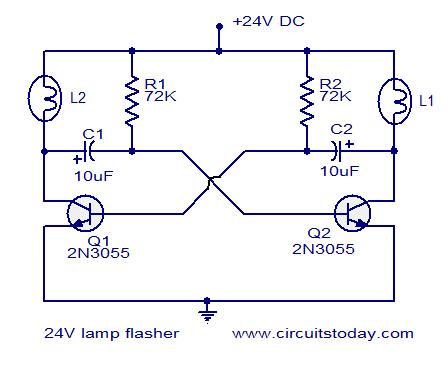 I need a 24volt dc powered flasher circuit so that the flash rate speed can be adjusted with a single knob. I only plan to flash one 24 volt string of led lamps . Need to vary the speed of flash a must have. What circuit might you recommend? Hi Thomas you can replace the resistances R1 and R2 with 470K linear stereo potentiometer used as a rheostat in series with 10K resistances to limit minimum value to 10K and maximum to 480K. since both the resistances are equally varied it will give you sufficient range as well equal on / off timing. Would you please email me the immages and any other info on this flasher system. I wish to try to buuild one to flash my light tower. Hi Macro yes you can. Can I do the same thing with 12V, and with 12V lamps?